Are you tired of the goat “handling you, instead of you handling the goat?”. This Goat Chute System takes care of that problem when working your herd for show or just health care, such as hoof care, shots, etc. The Chute is just the right height to sit and comfortably handle your goats with total control. Depth (not including ramp) : 4 feet, ramp is 4 feet long also and is detachable. Width: as viewed from the front, 24 inches or 2 feet. Ok so who sells this and where can I buy one? This email is invalid. If you do sell them like you said in the comment posted here then what is your website? Some way of shopping for it? I could not find it on Ebay. 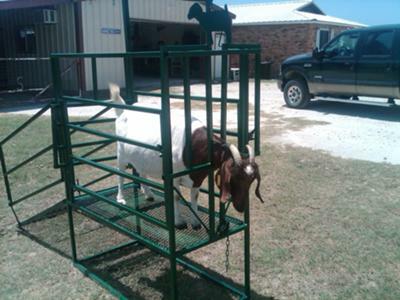 SO JOHN….I know these goat handling chutes…my good friend makes them…in fact the add you use is the same one he put on EBAY to sell HIS DESIGN AND WORK. These pictures are at his ranch in fact, his shop, his vehicles!! WOW…if you are going to lie and say that you make theses chutes, you need to do a better job of being a fraud. Even I recognize this as ANOTHER MAN'S WORK AND DESIGN! !